Laser Labels for Barcodes, Mailing and Book Processing. 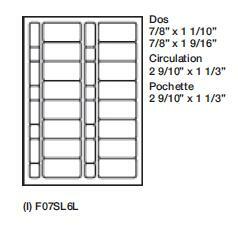 These label sheets perform consistently on desktop printers as well as larger copiers and sheet fed laser printers. They are flexible to prevent printer jam and have a 1/16" perimeter which is free of adhesive to eliminate buildup in your printer. Sheet size is 21.5 cm x 28 cm (8.5" x 11"). Packages are plastic wrapped for moisture protection. Price per package.